Reykjavík: Explore the city with your Local Expert. See the old town centre, the parliament building, Höfði House, the colourful harbour and the Hallgrímskirkja. Witness nature’s most spectacular show on earth – the Northern Lights. 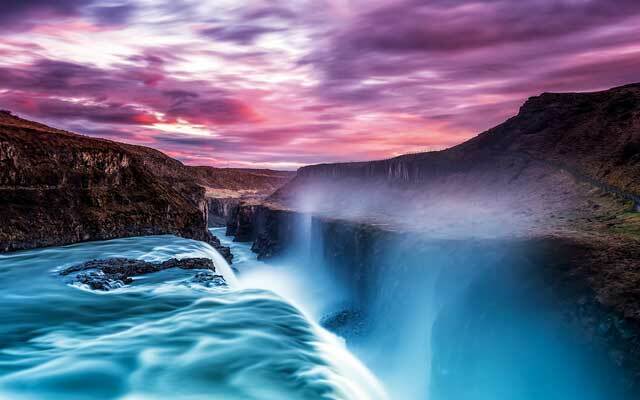 Gullfoss: See the spectacular two-tiered waterfall. This Icelandic equivalent of Niagara Falls drops a total of 32m (105 ft.), while spanning the entire width of the Hvítá River. Thingvellir: The Parliamentary Plains are the most important historic site of the country, as the meeting place of the Althing (world’s oldest parliament), founded in 930 AD. Welcome to Iceland. At Reykjavík’s Keflavík Airport, transfers depart for your tour hotel. Later, join your Tour Director for a Welcome Reception and an opportunity to get to know each other over a pleasant evening of dinner and wine. Afterwards, search for the most spectacular show on earth – the Northern Lights (Aurora Borealis). See the breathtaking night sky filled with an array of different colours. Please note: The Northern Lights are a natural phenomenon and sightings, therefore, cannot be guaranteed. Take a journey through the stunning landscape of Iceland‘s south coast to visit its newest geothermal heat and electric power station at Hellisheiðavirkjun. Continue on to witness the majesty of Seljalandsfoss and Skógafoss. Stand awestruck by the beauty and powerful force of these thundering waterfalls before venturing on to view more phenomena. After seeing the magnificent Hekla and Eyjafjallajökull volcanoes, arrive in the welcoming communtiy of Vík. Later, perhaps enjoy another chance to go in search of the mystical Northern Lights? 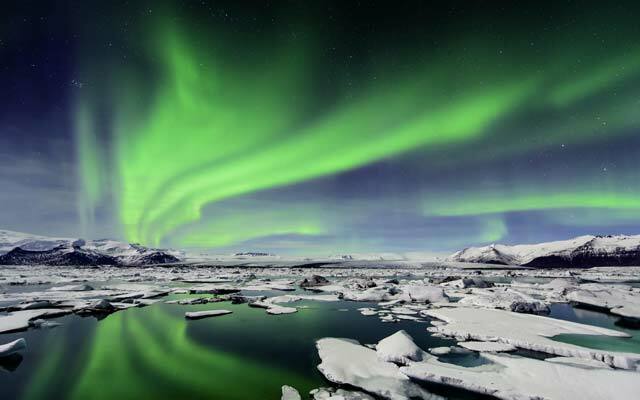 Embark on a day of discovery around Iceland’s Golden Circle, taking in some of the famous landmarks this magical country has to offer. Experience the exploding hot springs at Geysir and the mighty Gullfoss Waterfalls – the Icelandic equivalent of Niagara Falls. Next stop is Friðheimar, to find out about the processes in Icelandic greenhouse horticulture. Visit a family-run vegetable farm that specialises in tomatoes. Tour their greenhouses and sample the sweet, unique flavour of their lovingly-grown crop. Continue to your hotel in Flúðir, where there is again a chance to look to the night sky to watch nature’s theatre unfold. Travel southwards, stopping in Fontana to visit a fascinating geothermal bakery. Sample the delicious rye bread, dug hot from the ground and served with butter. Continue on to Thingvellir, where the first meeting of the Icelandic parliament was held in 930 AD. This remarkable natural site lies on the Mid-Atlantic Ridge line, where the American and European tectonic plates meet. Continue on the trail of Viking warrior and poet Egill Skallagrímsson to Borgarnes. En route, stop at the pretty village of Reykholt, home of poet and medieval scholar Snorri Sturluson. 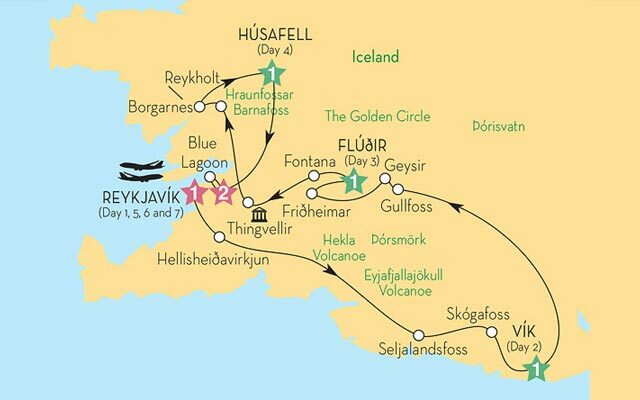 On arrival in Borgarnes, learn about Iceland’s history with a visit to the fascinating Icelandic Settlement Centre. 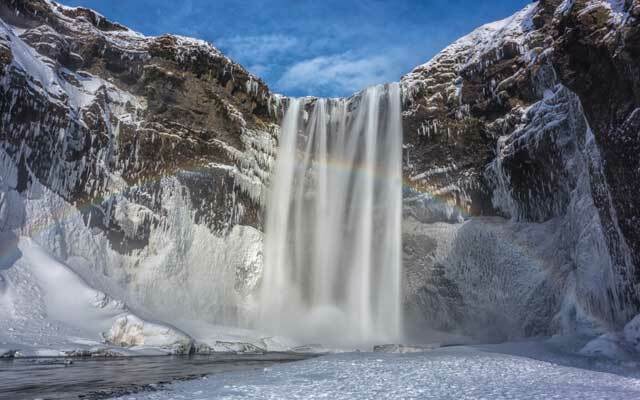 Journey on through glorious landscapes taking in views of the Hraunfossar and Barnafoss waterfalls and Deildartunguhver – Europe’s most powerful hot spring. Journey back to the capital – Reykjavík, where sightseeing shows you the old town centre, the 19th century parliament building, Höfði House (the location of the 1986 Reykjavík Summit meeting of presidents Ronald Reagan of the United States and Mikhail Gorbachev of the U.S.S.R.), the colourful harbour and the modern, landmark church – the Hallgrímskirkja. The afternoon is at leisure. 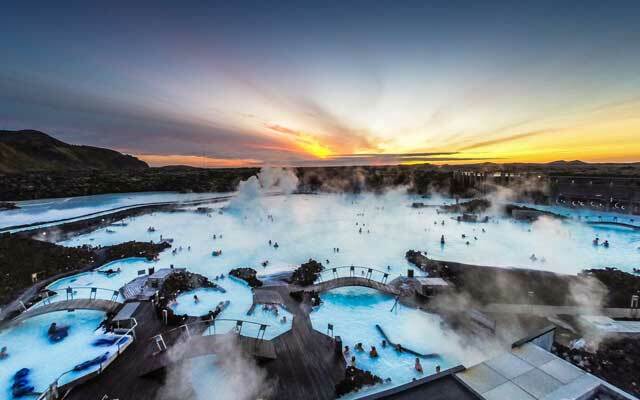 Relax and enjoy your final day with a visit to Reykjavík’s Blue Lagoon. Surrounded by lava fields and snow-capped mountains, the Lagoon is a wonder of nature and offers a unique experience for both body and soul. Choose to bathe in the pleasantly warm mineral-rich geothermal waters, or perhaps enjoy a water massage or spa treatment? Facilities also include an indoor geothermal pool, a winter garden and restaurants. With your new-found friends, toast the culmination of your fascinating journey of discovery with a celebratory cocktail. The rest of the day is free, perhaps spend time relaxing in a sidewalk cafe? Your Icelandic adventure comes to an end, with transfers arriving at Reykjavík’s Keflavík Airport at 05:00 and 12:30.